Per the twitter, Assistants at Arizona and USC are among those that have been named in an FBI investigation and are being brought up on corruption charges. More to follow, I'm sure. Apparently the Money was funneled through Adidas. Last edited by DrumNFeather; 09-26-2017 at 08:02 AM. Great start! Now lets see them bring eradicate the corruption in AAU! Shoe has dropped on this one (pun intended)... certainly more to follow. I can't remember who, but it seemed like there was somebody here suggesting we should 'play the game' referring to bribing players to remain competitive. I'm glad (or hope) we don't. cant wait to hear what these guys say when they flip. Brian Bowman was allegedly paid $100,000 to commit to Louisville. Odds that Akot or Markennen will be named? "We got lucky on this one," Pitino said at the time. "I had an AAU director call me and say, 'Would you be interested in a basketball player?' I said ... 'Yeah, I'd be really interested.' But [Bowen and his people] had to come in unofficially, pay for their hotels, pay for their meals. So we spent zero dollars recruiting a five-star athlete who I loved when I saw him play. In my 40-some-odd years of coaching, this is the luckiest I've been." Last edited by concerned; 09-26-2017 at 09:33 AM. All I know is what my partners who are former prosecutors tell me: The feds don't arrest someone, especially in high-profile cases, until they have a very solid case. Just sayin'. Often they arrest lower-level people and work on them to flip against the higher-ups, as concerned notes. In that case, I feel both hopeful and nervous. It would be great for Utah basketball if a few rival programs could suffer from this. But who knows if a finger ends up pointing at us? I love college sports, but I want a bunch of schools get the death penalty and the entire collegiate landscape, especially the money-sports, to just blow up. I couldn't care less which school(s). That said, I highly doubt that will happen, but am hopeful the federal indictment has much more teeth. chuckled and said, "nope looks like you guys are clean"
Last edited by Scorcho; 09-26-2017 at 01:14 PM. I was one of those guys. But with the FBI involved, I'm walking it all back. The NCAA enforcement team is a joke. Those involved are gonna know what a real investigation looks like. At the top of the list: Louisville. That wouldn't bother me at all, especially it also has a POS coaching football. Every basketball program in America is running scared right now, because this is how business gets done. A lot of people knew it, but nobody was able to lay it out with proof like the feds did on Tuesday. It’s a dirty sport, and today we know how dirty. "Did you know," Larry Krystkowiak asked in his Montana drawl, leaning over his lectern, "that there's a lot of cheating in college basketball?" His earnest delivery prompted some chuckles among the audience of roughly 40 people. But Utah's men's basketball coach wasn't going to leave it hanging without telling a story. He asked two compliance officials if he could venture on. The tale: He was once recruiting a top-level player, and the player (or his representatives) called Krystkowiak in the middle of the night. They told Krystkowiak the recruit's transcript would cost the Utes $50,000, and "it'll probably cost you $50,000 more to sign him...."
This is simply new and uncharted territory. I dont see how any head coach who has an assistant under investigation or charged survives. I think it only gets crazier from here. So, attorneys and other smart guys, please educate me. What, exactly, would these (alleged) crimes look like? I understand that it is a violation of NCAA rules to pay a player, etc., but that's not a crime (is it?). Rather, from the espn article, I am inclined to think that the crime lies in something like extortion/bribery/racketeering/conspiracy/influence-peddling. Obviously, extortion is illegal, but it is unclear to me at what point the others become bona fide crimes. So, help a guy out. Please. I said that if Larry wants to be paid like a top 15 coach, he needs to recruit better and unfortunately we were losing kids left and right because we didn't recruit dirty. I said it would be tough for Larry to keep his job at his salary level with the recruiting classes he had been bringing in. I have to say, thank the heavens my skepticism on doing the right thing was dead wrong. My hats off to Larry. He's a great man, better than me and a great example and reminder to fight for what's right. He's done it right, he's finding success and he should only get better. I'm very proud of him and what he's done. I hope I can someday be a semblance to the man he is. Isn't the FBI big into tax evasion? Maybe it's money passing hands and not being taxed. For example, Bag Man gives coach $15,000. Coach doesn't pay taxes. Then coach gives AAU coach $15,000. No taxes paid. Then AAU gives player/player's handler $5,000. No taxes. That's a lot of money the government was screwed out of. bribery conspiracy, solicitation of bribes, honest services fraud conspiracy, honest service fraud, conspiracy to commit wire fraud and Travel Act conspiracy. The U.S. Department of Justice said each of the coaches faces a maximum sentence of 80 years in prison. With charges and potential prison terms of that magnitude we can expect to see a lot of flipping before too long. The masterminds of this entire scheme are the ones the FBI really wants. [F]raudulent schemes to deprive another of honest services through bribes or kickbacks supplied by a third party who has not been deceived. I’m sure that makes everything perfectly clear. Anyway, those guys are in a heap of trouble. Well, this explains the sudden emergence of USC getting top notch players. That always bugged me. A couple of years ago when Alabama hired Avery Johnson they suddenly launched into the top 5 in recruiting. I tweeted at Jerry Meyer of 247 sports and asked him why schools who suddenly shoot up the rankings (I brought up Alabama and Cal) are not immediately thoroughly investigated for violations. He basically said 'meh. If it was Utah you wouldn't have a problem'. Of course I would love to have a top tier recruiting class every year, but it would also bother me if we were cheating. This whole thing bugs me knowing that we could have lost these top recruits to AZ because of money. But at hte end of the day, I truly believe Larry and co are clean. that makes me proud to be a Ute fan. So, the follow-up articles on espn are marginally helpful. 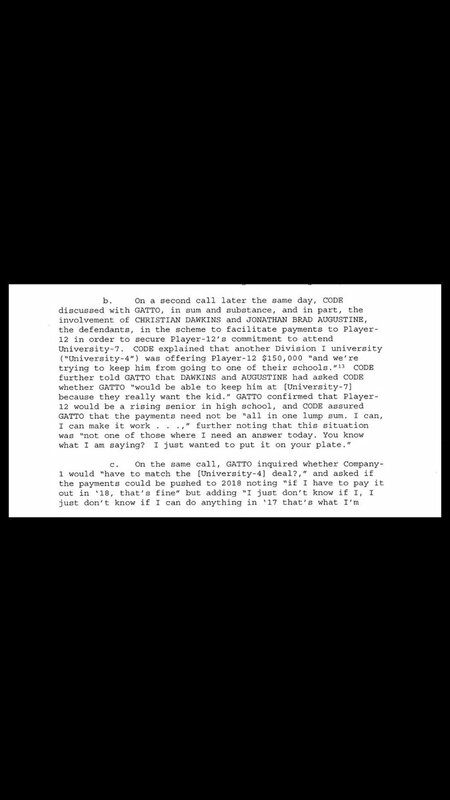 They indicate that the coaches were soliciting/accepting bribes from athletic-gear companies (or just one), and agents, and then the coaches agreed to steer the players to them. Some of that bribe-money / seed-money ended up in the hands of players, which is why the NCAA violations are afoot, but giving money to the players doesn't seem to be the crime. However, the one article (http://www.espn.com/mens-college-bas...-investigation) seems to leave some gaps in the dot-to-dot. Why is giving money to an assistant coach or young basketball player against the law? The charges brought forward include violations of federal statutes on bribery and wire fraud, among other laws. Any assistant coach found to be taking bribes while employed by an institution receiving federal funds, for example, could be liable to prosecution under federal law. This doesn't address why giving money to a "young basketball player" is against the law - probably because it doesn't seem to be. He claims he didn't know ANYTHING about what was going on in his program. Doe she even work there? What a joke. Moral to the story? You shouldn't surround yourself with turds. And, there comes a time in any relationship when you must refuse to defend said turds. Jurich would still be employed had he fired Pitino 3 years ago, like he should have. what happens to the recruits, like Bowman, who got paid $100K. Do they lose eligibility? Do they get dismissed? I just saw that one of Chuck Person's top 100 Auburn recruits decommitted. BTW--Thanks, Two Utes. That was very very informative.